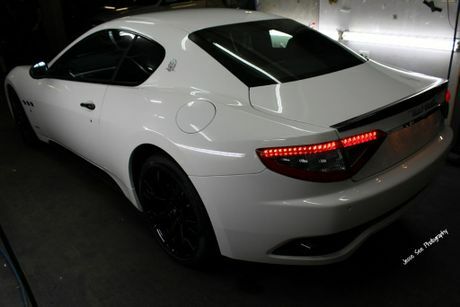 The new Maserati GranTurismo Sport Coupe. 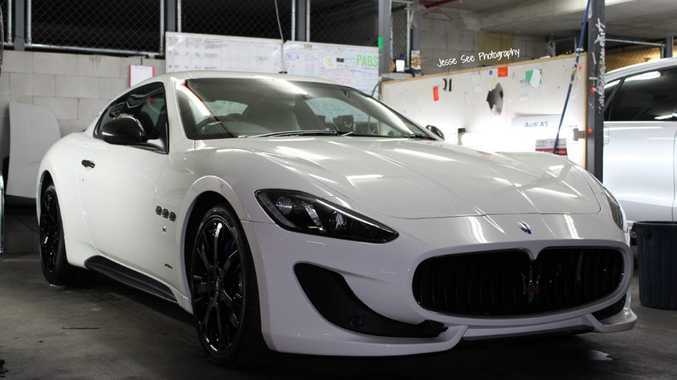 THIS is the all-new, 2013 Maserati GranTurismo Sport Coupe that was spotted getting detailed at an underground car park in Fortitude Valley, Queensland. Up front sits a 4.7-litre, 32 valve V8 engine which can produce up to 460 horsepower @ 7000rpm and 383 pound-feet of torque @ 4750rpm. This is 50 more horsepower and seven more pound-feet of torque than Maserati's most expensive model, the GranTurismo MC Stradale, which is their performance offering. Connected to the engine is a six-speed automated manual transmission, with manual shifting paddles behind the steering wheel, which then sends all the power straight to the rear wheels. It also has a curb weight of 1860 kilograms. This allows this re-designed GranTurismo Sport to launch from 0-100kmh in just 4.7 seconds, and it will keep accelerating until it reaches it top speed of 298kmh (185 miles per hour). This means it is 0.2 seconds faster in the 0-100kmh sprint against the MC Stradale, but it's top speed is three kilometres per hour (two miles per hour) slower. This GranTurismo Sport is replacing the old GranTurismo S, and the differences include an all-new front bumper, re-designed self-levelling and dusk-sensing xenon headlights with four LED inserts, a carbon fibre rear lip spoiler, door handles and side mirrors, sharper, more pointy lines on the side of the vehicle and an updated interior including new leather sport front seats which look better and also grip you tighter, and similar seats in the rear. The model I'm featuring today has an appealing metallic white paint job, with amazing blue brake calipers, which look stunning with this colour. Some other features that this GranTurismo Sport is equipped with includes variable intermittent rain sensing wipers, 20 inch, seven-spoke black painted alloy wheels wrapped in performance tires, double-wishbone front and rear suspension, a front and rear stabilizer bar, four-wheel ABS as well as traction and stability control, a post-collision safety system, an engine immobilizer, front and rear seatbelt pre-pensioners, front and rear ventilated disc brakes, electronic brakeforce distribution, tire pressure monitoring, a premium leather and alcantara interior, rear parking sensors, dual-zone climate controls and interior air filtration, 11 Bose premium speakers with 7.1 surround sound and much more. You can currently buy a brand-new 2013 Maserati GranTurismo Sport Coupe for a base price of $308,000 from your local Maserati dealer.